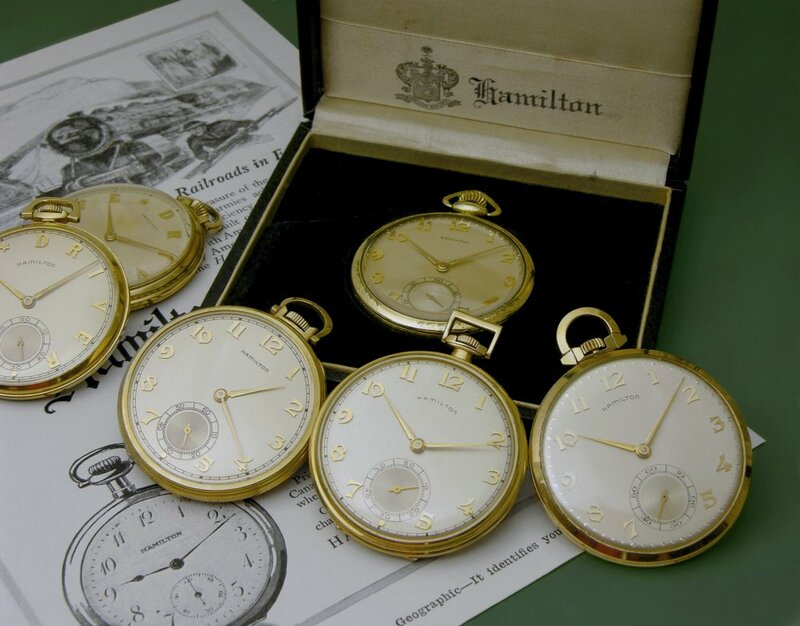 Hamilton produced two high grade 23 jewel movements in their 10 size series, the Grades 923 and 945. I'll deal with the 923 first. The Grade 923 was produced from 1936 to 1956. Only approx. 3,600 examples were made in total, (some sources say a little less). 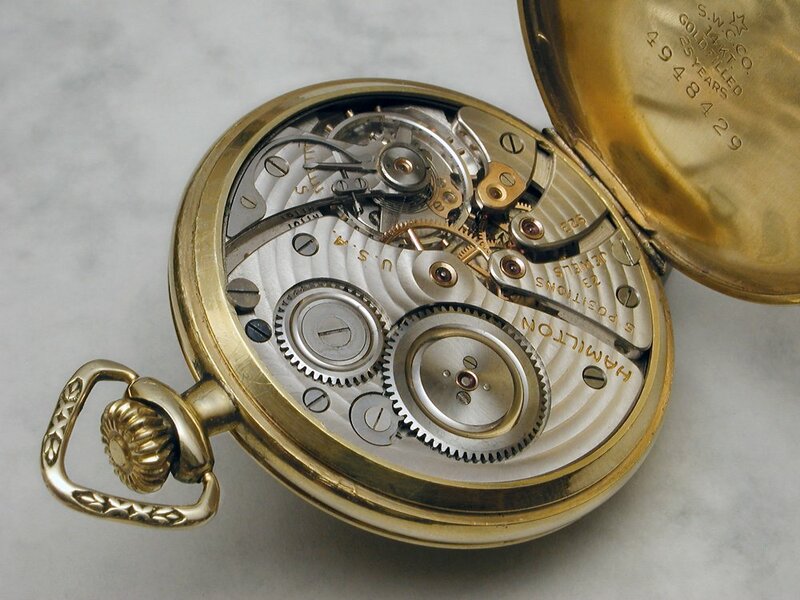 That's quite a limited number to begin with and with natural attrition, the scrapping of solid gold cased examples, and the recent use of the movement in custom wristwatch conversions the Grade 923 is now truly rare to find in pocket watch form. 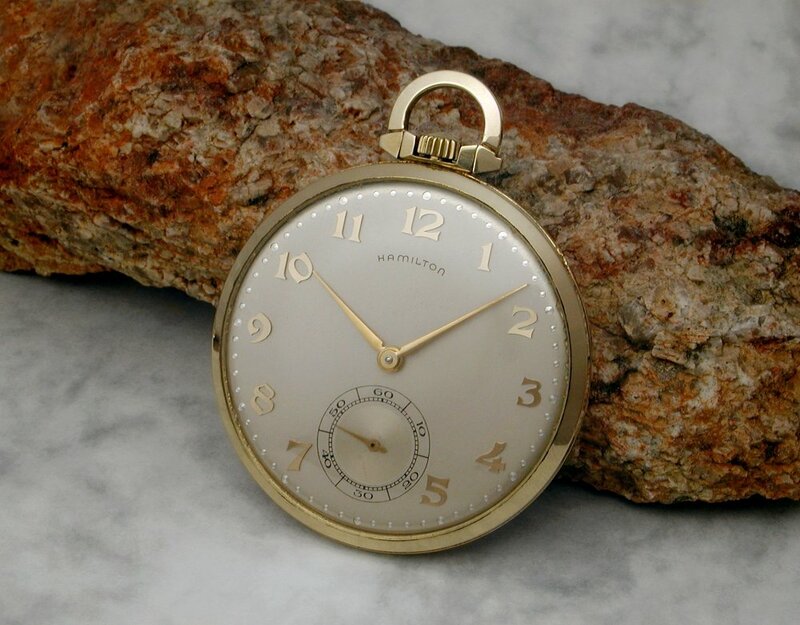 The 923 was Hamilton's premium gentleman's pocket watch size movement at the time. It benefitted from its relatively late production in the use of advanced materials such as the Elinvar-Extra hairspring and monometallic balance. My example shown below was produced in 1945. 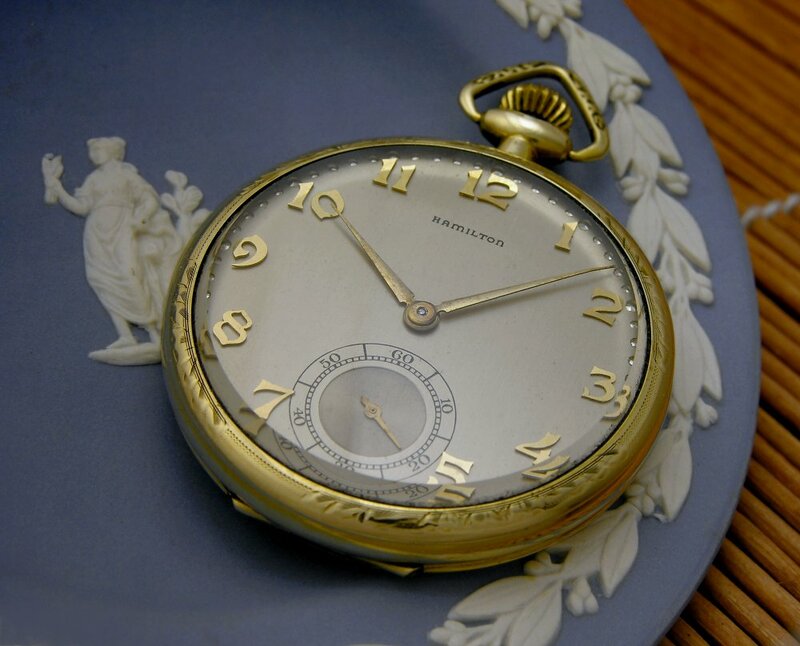 As is common with many of these watches the dial is silver with applied gold numerals. I'm not sure if this style of Hamiton box is correct for the period, but it certainly fits the 10 size watch snugly and so that's where my 923 resides. 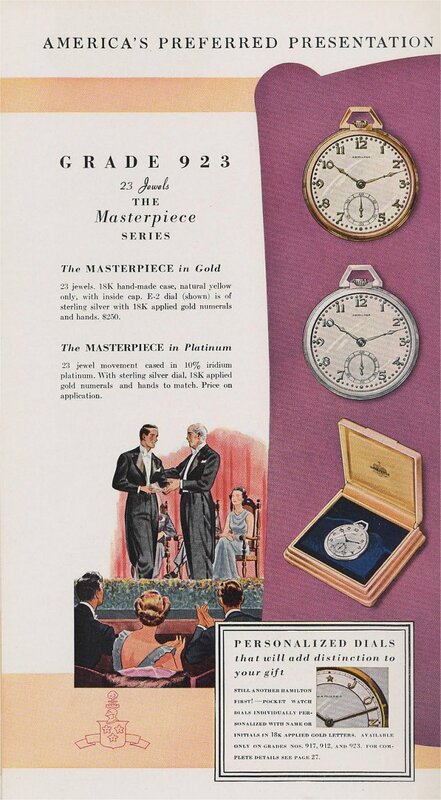 A Hamilton catalogue page showing some of their Grade 923 watches for 1938. 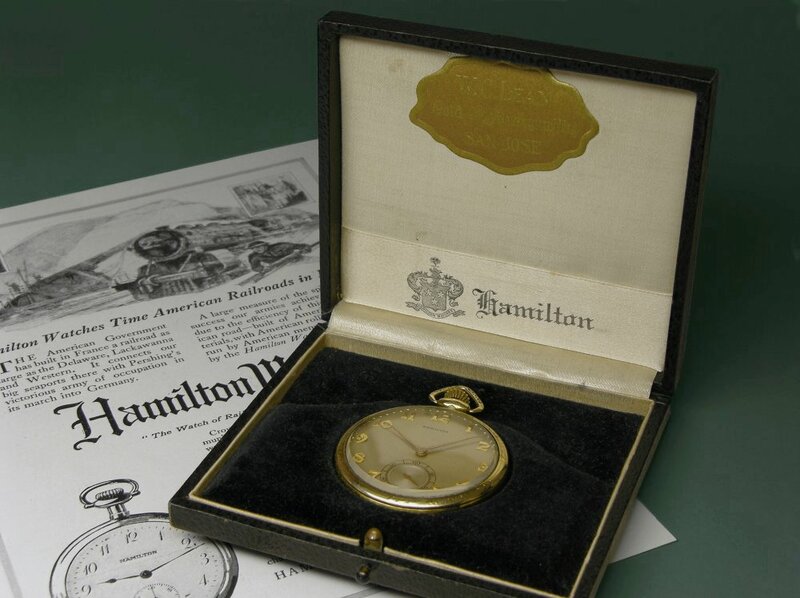 Presentation and custom dial watches were an important business for Hamilton. Now we come to the Grade 945. This movement replaced the Grade 923 and was produced from 1956 to 1968. The last of the Hamilton 10 sizers, the Grade 945 is not as well documented but from what I can gather around 27,500 examples were produced. Many of the Grade 945 watches were used for presentation pieces. They were produced rather late in the day for pocket watches, when wristwatches had well and truly taken over as the norm. Hamilton's American-made movement production ceased altogether by 1969. The Grade 945 is also a 23 jewel movement with jeweled motor barrel and adjusted to 5 positions like the 923, but it retained the train bridge style, non-micrometric regulator, and straight line damascening of the 17 jewel Grade 917 which was the base grade for the 10 size series. In effect it could be considered an upjeweled, more highly adjusted, Grade 917. A very fine movement and practically speaking it would perform as well as the 923. It may be that Hamilton considered the 923 too expensive to continue producing and opted to replace it with the 945 as a more economic high-end option. 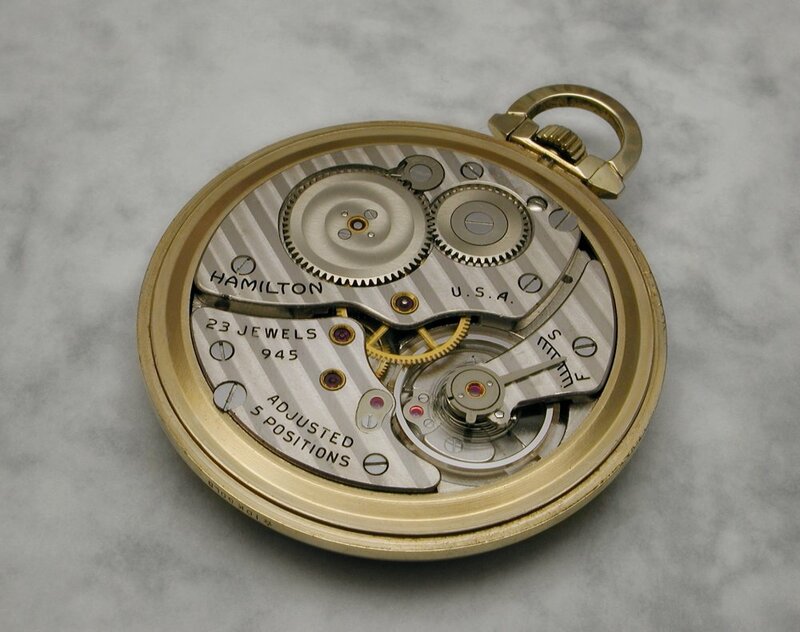 Hamilton's parts interchangeabilty capability had reached a point by 1955 where serial numbers were no longer considered neccessary, (apart from on Railroad Grade movements where it was a requirement). Thus, the Grade 945 movements carry no serial numbers. 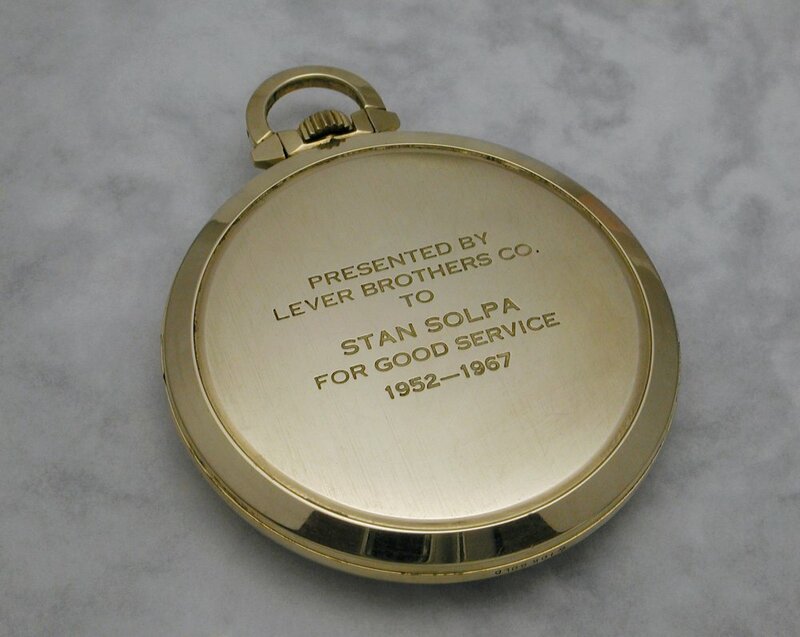 True to the common use of Grade 945 watches as presentation pieces my example below was awarded for Good Service circa 1967 as per the caseback engraving. (You can find the results of some research into this watch and its owner in this post). 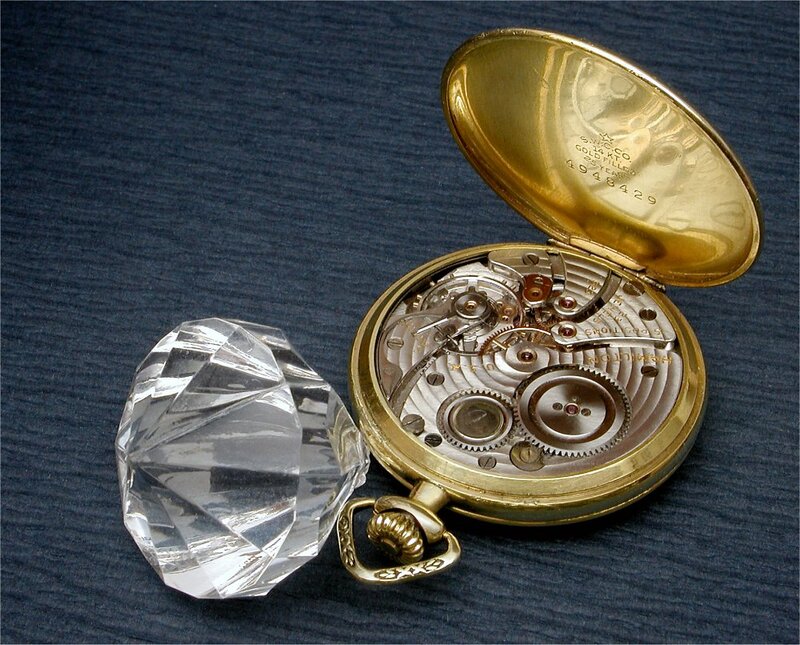 Below is the Grade 945 movement in this watch, and below that is a shot of a 17 jewel Grade 917 watch to illustrate the similarities between the two movements. Below is a group shot of Hamiton 10 size watches. 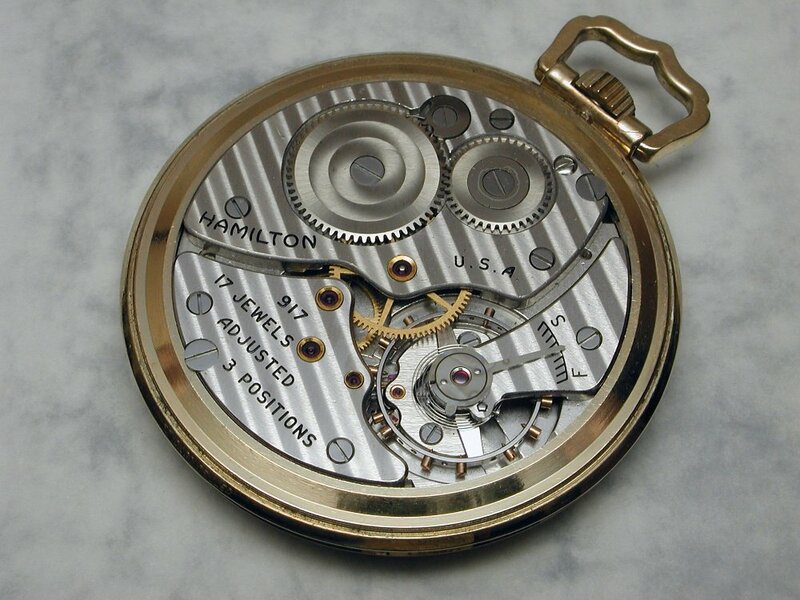 The Grade 923 is in the Hamilton watch box and the Grade 945 on the extreme right. Next Topic: Is the Rolex DeepSea D-Blue ?